The Center for Urban Transportation Research (CUTR) held the second annual “Bulls Walk and Bike” week, September 9-13. USF students learned about Florida’s bicycle and pedestrian laws. The event promoted awareness of bicycle and pedestrian safety. The week-long activities kicked off with a press conference and stroll around campus with USF President Judy Genshaft. MPO Executive Director Ray Chiaramonte participated as a speaker. 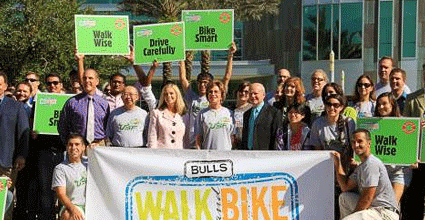 Bulls Walk and Bike Week is supported by grants from the Florida Department of Transportation’s Community Traffic Safety Program. Other events included Walk Wise and Bike Smart safety presentations, a Bicycle Celebration event, and a Cycling Savvy course. CUTR gave away numerous rewards for participation throughout the week including t-shirts, water bottles, first aid kits, reflective gear, helmets, bike racks, and ten free bicycles! MPO staff participated in a second Complete Streets Summit at the Marshall Center, the first one was held in April 2013. “Complete Streets” aim to ensure roadways are designed with all users in mind. The MPO staffed an Imagine 2040 iPad station to gather input on the blueprint for the future of Hillsborough County’s long range land use and transportation plans. We received lots of input from a generation that will be directly impacted by the feedback given now. For more information contact Lisa Silva at silval@plancom.org or 813-273-3774 x329.